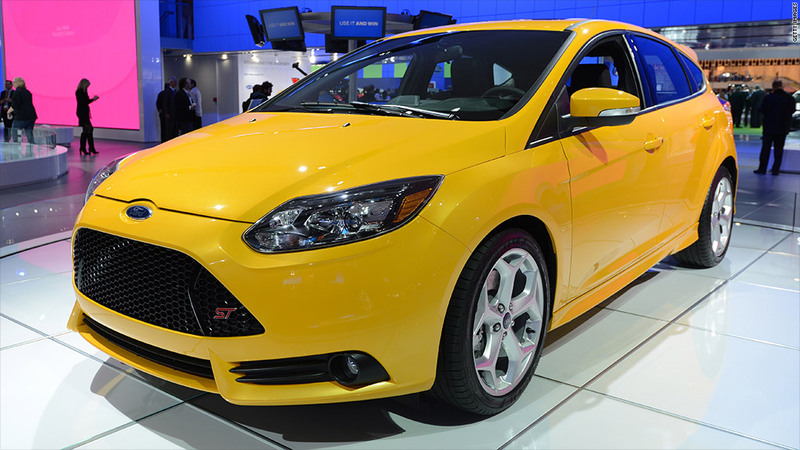 The Ford Focus retained its title as the world's top-selling car last year, according to figures from sales tracker R.L. Polk & Co.
Focus sales totaled 1,020,410 cars globally last year, according to Polk data released Tuesday by Ford (F), up from 879,914 in 2011. Coming in second was the Toyota (TM) Corolla, with 872,774 cars sold in 2012, while Ford's F-Series pickup was third at 785,630. A Polk spokeswoman confirmed the figures. A Toyota spokeswoman said when the company included versions of the Corolla besides the basic sedan -- such as the Corolla Wagon, Altis and Axio -- Corolla sales totaled 1.16 million globally last year. U.S. Focus sales rose 40% in 2012, Ford said, while in China, Focus registrations -- a proxy for sales that's often used in international markets -- rose 51%. China was the best-selling market for the cars, accounting for more than a quarter of Focus sales globally. Erich Merkle, a sales analyst at Ford, said the data show the tastes of U.S. consumers converging with those in international markets. "The U.S. is moving towards smaller vehicles like the Focus, like the Escape," he said. "I don't think there's ever been a time globally when the U.S. [market] has been more like that of the rest of the world." Correction: An earlier version of this story misstated the number of Toyota Corollas that the company sold last year.